When your 14-year-old son Jonathan inquires as to the availability of the old couch in the basement, you know you’re in trouble. In trouble, because a split-second after the question left his mouth, I began doing the math: couch in basement; Jon’s room on second floor; older brother away at college. I knew where that piece of furniture was headed, and I knew who would have to help him. Two cramped, winding staircases and one door-taken-off-the-hinges later, we – well actually, just me – collapsed on the couch in its new home, in the corner of Jon’s room. Jon reconfigures his room fairly regularly. He’s painted the walls, hung things from the ceiling, and rearranged the furniture countless times. 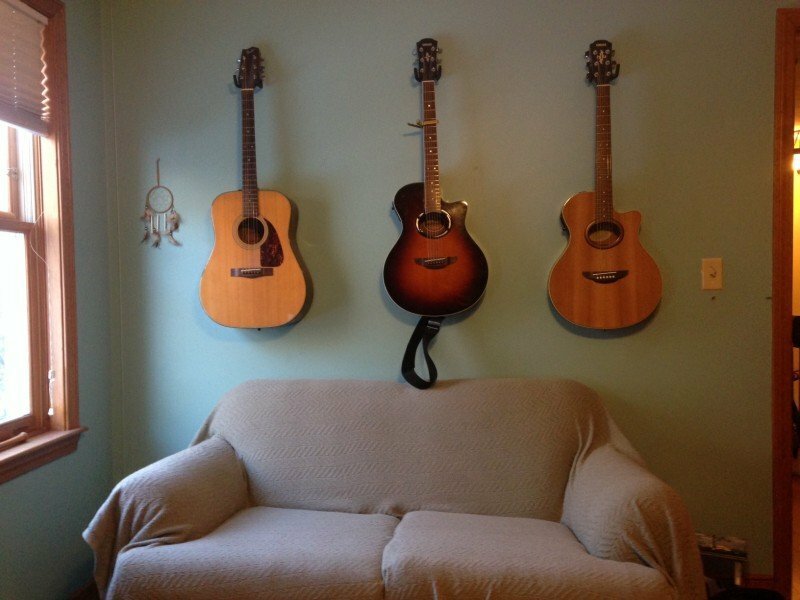 This most recent iteration was a function of his desire to hang three guitars on the wall, above the couch. He thought it would look cool. I sweatily agreed. So off to Lowe’s we went, looking for hooks that would be sturdy enough and padded enough to support the guitars without damaging them, but still make it easy to take them on and off the wall. We eventually found some – way back in aisle 7, in the garage-organizing area. Perfect hooks, but I wasn’t sure how best to secure them to the walls. So I asked the cheery, red-vested man in the hardware section. Cheery Red-Vested Man: What are you hanging? Cheery Red-Vested Man: What kind of walls? Me: Nah, we’re just two average guys. Oh, you mean the walls. No, no studs that we can use. He thought some more, took another sip of coffee and handed me a package of “butterfly drywall anchors.” “These should do the trick,” he said with a smile. And off he went. An hour later, the guitars were up (see photo). But you know what was most interesting to me about our conversation with the cheery red-vested man? How easy it was for him to point us in the right direction. He, on the other hand, simply asked some questions, thought some thoughts and gave us the solution. All while sipping his coffee. It reminded me how much each of us knows about our respective areas of specialty. It also reminded me how often we solo professionals neglect to notice – if not actively downplay – the value of this perspective. Nothing wrong with any of that. But much of the value hidden within the work is perspective and experience; an in-depth understanding of the problem at hand and how to approach it. Cheery Red-Vested Man knew which questions to ask in getting to a viable solution. When it comes to the work you do, you’re equally capable. So how about this? What if you sold that knowledge and guidance as a standalone? A coaching option, if you will. You’d still offer the complete package for those who want it. But for others, you’d act as guide, someone who touches nothing, and instead simply whispers in the ear of clients as they move through a project. It’s a great way to expand your offerings, something I’ve been doing now for several years. It’s good for your clients: They get access to your wisdom and advice for a fraction of what it would cost if you did everything for them. They also get smarter along the way, something they don’t get when they hand all of it off to you. It’s good for you: Sure, you make less money on these projects. But you also work a lot less: Sharing perspective and guiding others through a jungle that you’ve grown up in is easy (I frequently drink coffee during these conversations). Plus, it makes you available to many more people and companies who, while they may think you’re terrific, are not interested in / capable of paying for your all-in solution. Not at all. Plenty of people/companies don’t want to do it themselves – they want a turnkey solution and will continue to buy that. All we’re doing here is expanding the options. Now more people can avail themselves of your services, and in a way that better matches their budget and interests. Here’s the bottom line. You’re sitting on a ton of valuable knowledge and perspective – much more than you probably give yourself credit for. See if you can find a way to sell that as a standalone, and you’ll have more clients and more money. I just hope you like drinking coffee. As a guitar player, I’d like to share some of my knowledge and wisdom – please be sure there is humidity in that room during winter or there is a big risk of the guitars cracking from exposure to dry air. Looks great, btw. Nice job. Thanks Diana (and thank you for not taking my advice and charging me for that expert wisdom)! We’ve often got a humidifier going in that room – problem, or is that good for the guitars? As the father of a 10 year old Jonathan, I have such things to look forward to! Guitars (and other wooden instruments) look for an optimal humidity of 42%. If you can achieve that, you will have happy guitars. Also, beware of sun bleaching of the wood, with them next to that window. Excellent, thank you Mark! I will get the humidity-tester in place. Great points, Michael. I’ve noticed that more successful self-employeds like you are doing just this: offering training/coaching and writing e-books to help others and also earn additional revenue. I’m 5 years into a successful freelance writing career, and at a freelancer’s group meeting recently, realized how much I’ve learned that I could share with others. So I’m going to speak at the next group meeting about what I’ve learned and share some tips for freelancing success. I suppose I could package some of my nuggets of wisdom into a course or e-book, but there are several successful freelancers already doing this now, so I’d actually have some pretty good competition. But we’ll see how my little talk goes and take it from there! Sounds great Don! And don’t worry too much about the competition. As long as you fill your content with your unique perspective and voice, your followers will find you. Plenty of clients to go around! You didn’t fool me for a minute. years (with an aching back from sofa-hauling). unrequited love! (Worked for me). You figured me out, Brandon! Jon may be on his way to becoming an Interior Designer/Decorator. I too re-configured my room (shared with little sister) almost monthly! I love that you helped him and allowed the process to display his personality and his passion! You are a good dad! And yes, my consulting service is doing well…. You may be right about the design side of Jon. He’s the first one anybody goes to with a fashion question in the family so interior design can’t be far behind. And great to hear that things are going well for you! Thanks for reading (and writing). Enjoyed your post, photo and Soundcloud. It appears Jon got his good looks from his mom (jk) but from whom did he get his smooth voice? I advise you to spend your fortune and have some fun now. You needn’t worry about your waning years. Yes, my children don’t look like me at all, but they do look like each other, so at least my wife had a long time relationship with someone! Michael, you’re a good dad. Hopefully you (sweatily) agree. as always, I enjoyed reading your newsletter. I’ve been working away on a proposal to take advantage of a niche market (gotta convince the big guy that there’s long term value, in giving me a short term break on the commission split) and I think I’ve fried some of my cerebral circuits. Took a minute to listen to Jon’s recording. It was wonderful! Put me in happy place and allowed me to chill for a few minutes. I think he’s got a bright future in music ahead of him. Loved the cool, laid back vibe. Bravo. Thanks Laura, I will let him know he’s got a fan! And I hope you can share more about your niche market once things develop. Real estate related, I assume? I just love the way you pick out life’s little nuances and relate them back to your readers in an insightful fashion, especially in terms of connecting it all back to improving your business. Thanks Kevin! I find it’s a nice way to avoid doing any research too. Glad it’s jelling, Diane! Chances are nobody will think you’re a clown (how big are your feet? ).